MainAll NewsInside IsraelSupreme Court Built to Masonic Guidelines? Supreme Court Built to Masonic Guidelines? Article in Maariv points to Eye of Providence, pyramids, Rothschilds' involvement as tell-tale signs. 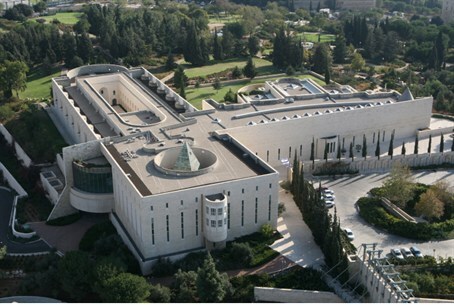 Was the Supreme Court building in Jerusalem designed in accordance with the ideology of the secret order of Freemasons? Gilit Chomsky, a respected writer, has devoted an article to this question in Maariv-NRG. Chomsky says that the evidence of Masonic intervention in the building's planning is hard to deny. Right at the entrance to the building, she notes, the sign thanking the donors whose funding made its construction possible features the “Eye of Providence” – a well-known Masonic symbol that represent's G-d's all-seeing eye, which also appears on the U.S. Dollar bill. Chomsky cites evidence that has been put forth by an amateur historian, Elad Pressman, in a website – Conspil.com – devoted to conspiracy theories. Pressman, 27, is a student of philosophy and mathematics. According to Pressman, the building is full of Masonic imagery, and the tours conducted through it are held in accordance with Masonic principles. Chomsky notes that the Freemasons exist as a recognized organization in Israel and that people who want to join them can do so. A study by Yuval Kaspi and Lilach-Shira Gavish has established that large parts of Tel Aviv were built by people who belonged to the Freemasons and other secret groups with names like Bnei Moshe, Bnei Brit (no connection to the better known B'nai Brith) and Bnei Tzion – which were established by former Freemasons and imitated Masonic ideology, with an added Jewish angle. The Supreme Court building in Jerusalem, notes Chomsky, was built in 1992, with funding that had been offered by the Yad Hanadiv foundation. Many members of the Rothschild family, which owns Yad Hanadiv, were proud members of the Freemasons, she says. A person taking part in the tour of the Supreme Court ascends inside a pyramid which peaks on the roof of the court building. There is a hole in the tip of the pyramid, which represents – according to this explanation, the Eye of Providence. The tourist climbs thirty steps to reach the top of the building, and ascends from a relatively dark entrance lobby to a well lit top floor with a beautiful view of Jerusalem. Chomsky explains that this can be seen as corresponding to an ascent to enlightenment, in accordance with the mason's beliefs. The number 30 represents the first thirty levels a Mason can achieve in his life, out of a total of 33. The last three levels might be located in the library, which is divided into three floors. The first floor is for lawyers, the second for active judges, and the third for retired judges only. Chomsky notes, however, that while the Rothschilds donated the money for the building, they did not plan it. The architects who planned the structure – Ada Carmi-Melamed and her brother, Ram Carmi – were chosen in a competition that was held in 1986. In a book they wrote about the planning of the structure, they make no mention of Masonic ideology.